Liverpool marked their return to the Champions League in dramatic fashion as Gerrard converted a last-gasp penalty. Welcome to TSMUCL where tonight this report below is the game between Liverpool and Ludogorets. We hope you enjoyed the match and enjoy our views and Coverage. The teams where out and the teams where announced we are ready for Gameweek #1 in the UEFA Championsleague 2014. These are the sides for tonight's game- Liverpool: Mignolet, Manquillo, Lovren, Sakho, Moreno; Gerrard, Henderson, Coutinho, Sterling, Lallana; Balotelli. Ludogorets: Borjan, Alek, Minev, Moti, Junior Caicara, Anicet Abel, Dyakov, Marcelinho, Aleksan, Bezjak, Misidjan. The "You'll Never Walk Alone" chants have started an that starts and now the fans know that Champions League football is back at Anfield after five years! Liverpool Kick off the game and the UCL is back in Liverpool. A quick start from Liverpool leads to nothing, Balotelli has now made four appearances in the Champions league for four different teams, Liverpool, Inter, AC Milan and Manchester City. Balotelli has a run and is taken down and laughed at by Ludogorets fans, Liverpool free kick, near post clearance, Ludogorets break but outnumbered by the LFC defence. An early Yellow card for Aleksander Alekzanderov, (Ludogorets Right Back). Alberto Moreno makes a blistering run but it was too high for Balotelli. Lots of fouls have been given away and lots of sloppy play that have caused throw-ins have gon to waste. Liverpool and Ludogorets are not having a good half. A chance was taken by Liverpool, Balotelli with a good interception runs into the box shoots, Sterling gets to it but can't score! Manquillo has made a strong start in the first twenty- five minutes. Shouts for a penalty from the Ludogorets players in the twenty eighth minute but the referee had none of it! Balotelli takes down Dyakov as to say watch out, thirty minutes gone, Liverpool 0-0 Ludogorets. Henderson is getting talked to by the Referee. Balotelli has a long range effort but Borjan saves. An Ordacious effort is hit by Moreno but sailed over the bar with no intention of hitting the back of Borjan's net. Ten minutes of the half remain and Liverpool undoubtably the stronger side out there. Anicet Abel has a go for the Ludogorets but the shot curls wide of the target. A chance from Liverpool came from a corner that sailed wide but before that an effort from Lallana was put out for a corner to Liverpool. 5 minutes of the half remain and no goals where scored, but could either Liverpool or Ludogorets find an opener before Half time? Just before Half time Ludogorets appeal for another penalty but it's not given. 1 minute was added on at the end of the half but no team could take advantage of that and the first half ended goalless. HT: Liverpool FC 0 - 0 Ludogorets Razgrad. KO: The fans of both sides are back in their seats ready for the lift of the second half between Liverpool and Ludogorets with the away side taking the kick off at Anfield. Latest from the other game in Group A: Real Madrid 4-1 Basel. A chance cam on fifty two minutes for Manquillo but he chipped the ball too far up just over the bar! Henderson and Manquillo are working well together in this second half. Junior Caicara gets a yellow for a rash challenge on Moreno. Liverpool have a free kick, Gerrard shoots and Borjan clears up the ball, a weary effort by The Ludogorets player doesn't trouble Mignolet. An hour has gone at Anfield but still no goals have been scored. So far Liverpool have had 12 attempts with 4 on target and Ludogorets have had 4 shots with just the 1 on target. SUB: Borini ON, Lallana OFF. Gerrard heads the ball, it's on target but. Borjan makes a great save to put the ball out for a corner to Liverpool and the corner is wasted. Ludogorets could have gone in front but the ball is struck against the post it comes out for another shot and it's just wide, Liverpool 0 - 0 Ludogorets. A chance falls but he heads just wide... 75 minutes gone and it's still a draw in Liverpool, England. A wayward effort from Lucas doesn't trouble Borjan. It just sails over the bar like he wasn't looking where to strike the ball. At this point at the game on 80 minutes Lambert was warming up for Liverpool as he could make his first ever Champions. League appearance. Balotelli puts the ball into the back of the net for Liverpool with a sweetly struck volley in the 82nd minute. GOAL! Balotelli puts Liverpool ahead versus the Ludogorets at Anfield with eight minutes of the game remaining! Liverpool 1 - 0 Ludogorets. SUB: Dyakov OFF, Espinhyov ON. Liverpool: 20 attempts with 8 on target. Ludogorets: 10 attempts with 1 on target. GOAL! Ludogorets score in the 90th minute to shock Anfield right in front of the KOP end with Dani Balo taking the ball past Mignolet to score but to finish off the game Liverpool had a penalty and a chance to win... Gerrard... Anfield are praying... And Gerard gets the late win for Liverpool and gives the home side all 3 points! A last gasp chance from a corner for Ludogorets but Mignolet saves Liverpool and it is Full Time at Anfield. FT: Liverpool 2 - 1 Ludogorets Razgrad. What a game from Gameweek #1 in the UEFA Champions League with TSM, we have more reported games tomorrow including, Chelsea vs Schalke and Bayern Munich vs Manchester City. The roundup of tonight's games are on this website and coverage from Borussia Dortmund vs Arsenal. 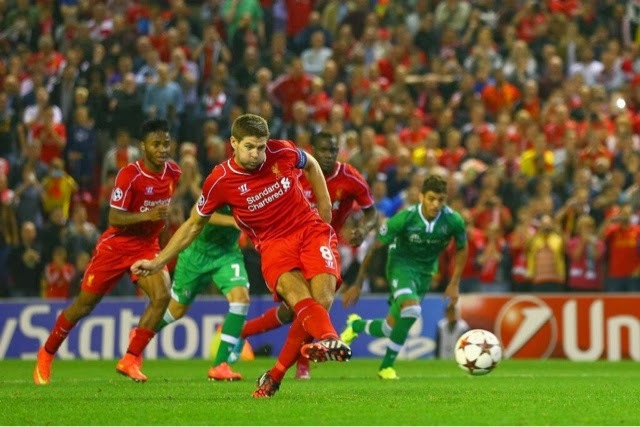 Liverpool return to the Champions League with a dramatic win against Ludogorets.